Met up with Zack on Saturday, and we drove south to visit a spot in the Flatside Wilderness. 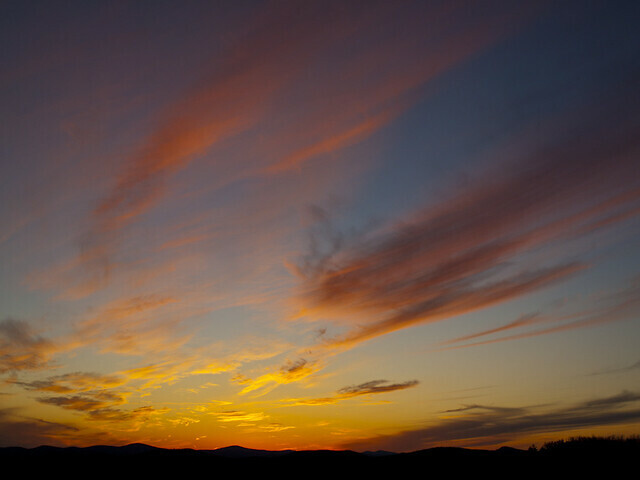 The hope was that we would catch a decent sunset over the Ouachitas, and he had an idea for a spot. We weren't going to Flatside Pinnacle, the usual spot to go in the area. But instead we stopped along the Winona Scenic Drive near another mountain, that had some good views. It wasn't that long of a hike to get there, but it was steep. There was no trail, and there was a considerable amount of rocks and trees and thorns to pass by first. I was out of breath, but did enjoy the view. 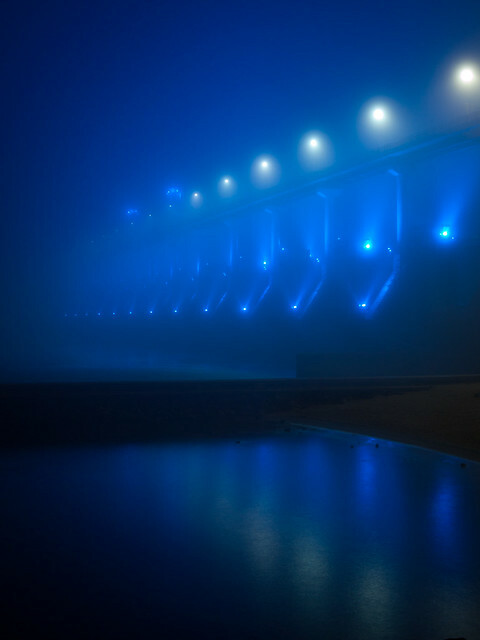 While the Big Dam Bridge is close, I've taken pictures of it in the fog many times already. 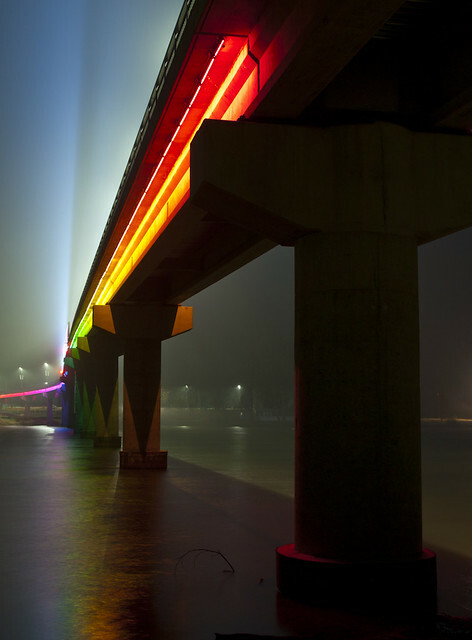 But the Two Rivers Bridge is also nearby, and I haven't gotten any pictures of it in the fog. So I crossed over the I-430 bridge and made my way to the foot of the bridge. The fog was still thick at the river, and I started to take a few pictures. 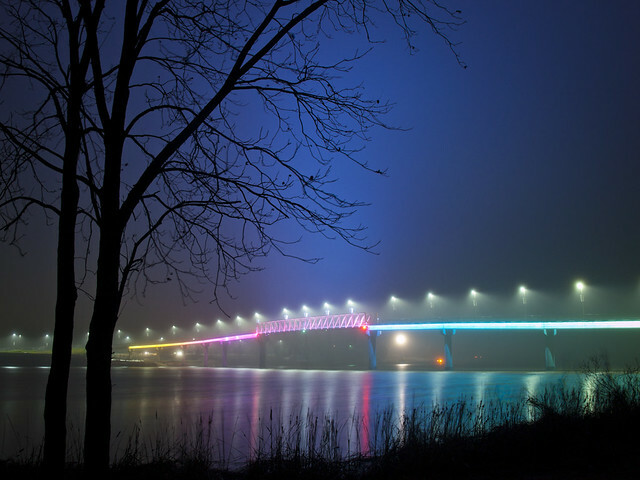 I was pleased to see that even on a cold and foggy January night, there were a few people out strolling on the bridge. 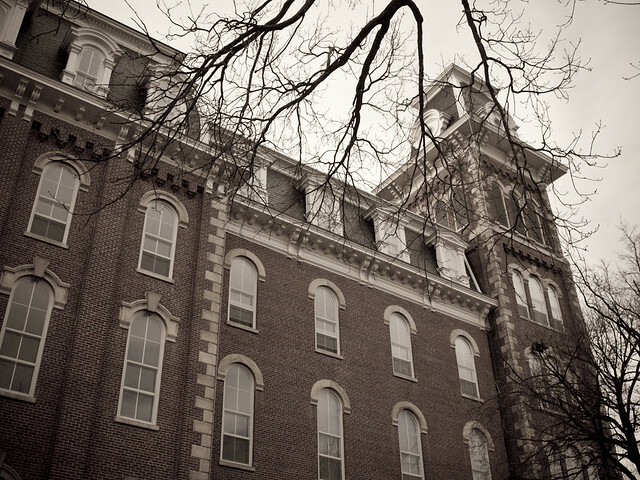 Last weekend, I made the drive up to Fayetteville to see my brother and do some sightseeing around Northwest Arkansas. 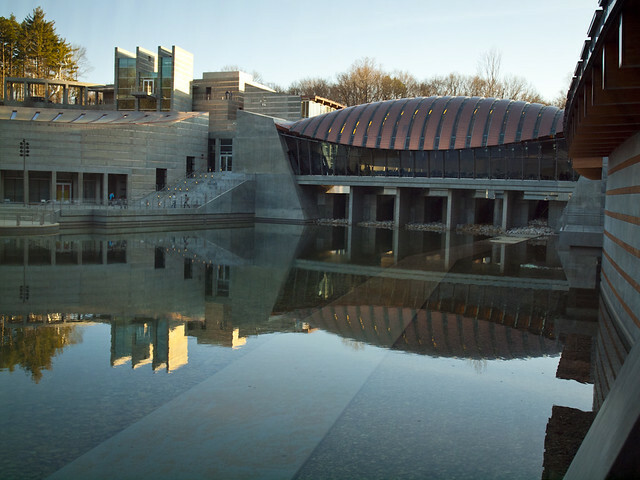 First, we drove up the freeway to Bentonville to visit the new Crystal Bridges Museum of American Art. 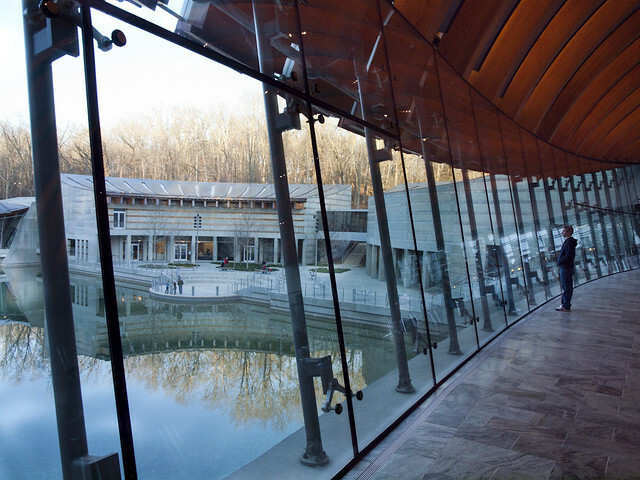 The museum is nestled in a valley, the buildings situated above spring-fed pools. The museum is impressive. There are a lot of famous works on display, including one that cost $35 million to acquire. But one thing that really struck me while visiting the museum is how neat the architecture is. 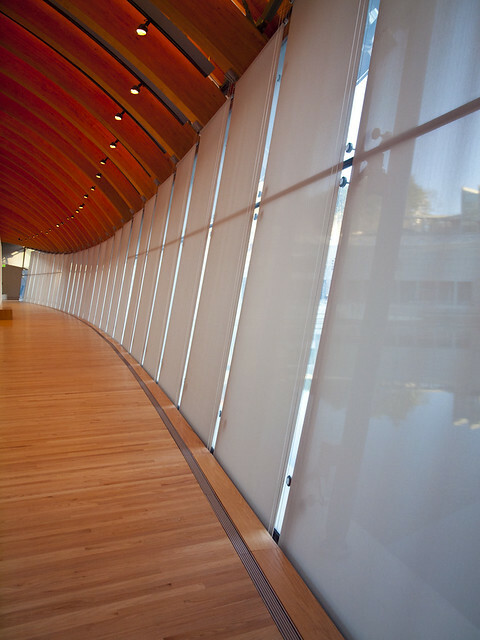 The galleries are set in a series of interconnected buildings with massive windows. It's nice that you can view the surrounding bit of nature while walking through the galleries. The artwork in the museum is surprisingly good. But one thing I noticed was the distinct lack of photography there. Now I might be biased, but I tend to think that photography is an important and noteworthy addition to the art world. 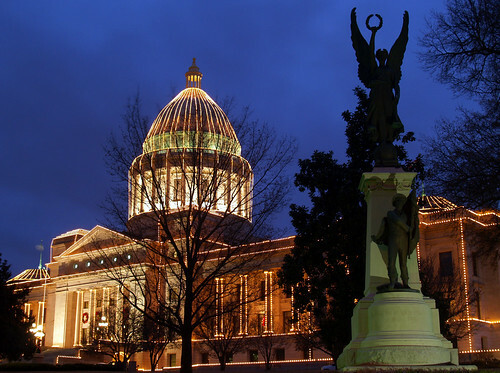 There is even a photographer whose work in the early 1900s has become famous and well-known in the art world, and who is from the Arkansas Ozarks. But you don't see very many photographs at Crystal Bridges, which is a shame. 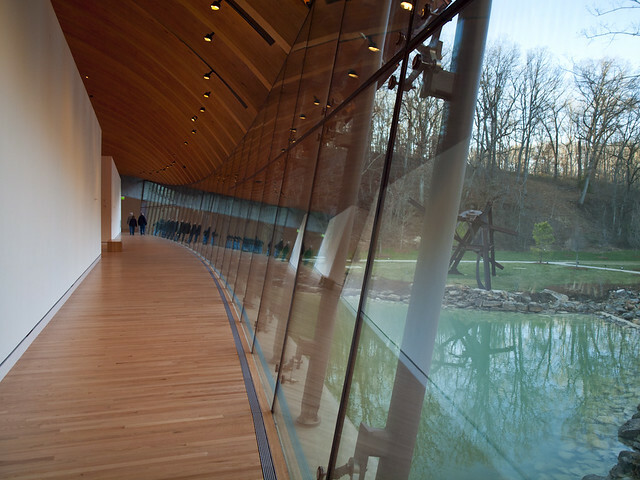 Granted, Crystal Bridges might have a bunch of photos in its collection, but hasn't put them out on display yet. But of course, if the museum would like to add to its collection of photography, I think I know of a few local photographers who would be happy to help. If Alice Walton is reading this, I would be happy to sell some pictures to the museum, and at a cheaper rate than $35 million (prices start out at $34 million, but I'd be happy to negotiate!). 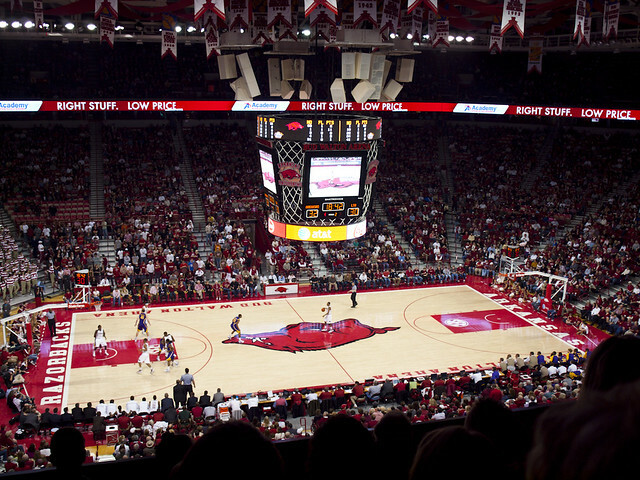 The Razorbacks beat LSU 69-60. From there I managed to find Hwy. 16 and took the scenic way home, following the Pig Trail back down to the freeway. 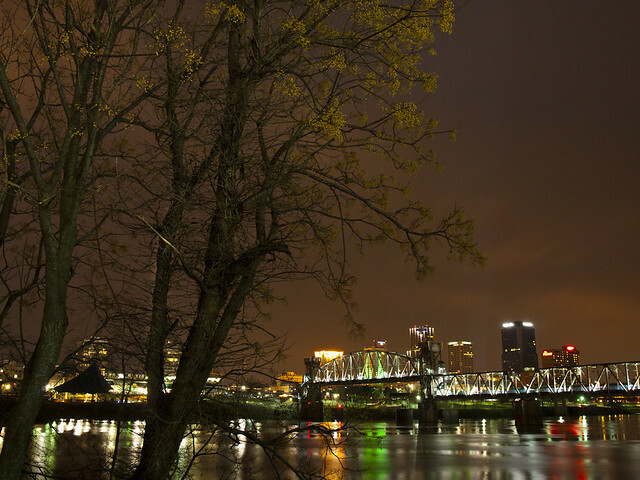 Here are some shots from a trip to Junction Bridge on Saturday night. 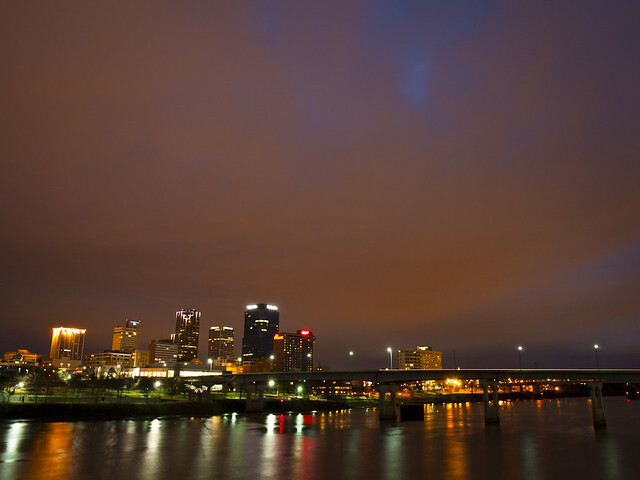 It was cloudy and cool, but pretty comfortable out for a January night. And even though it was overcast, there was still some nice light in the sky at dusk. 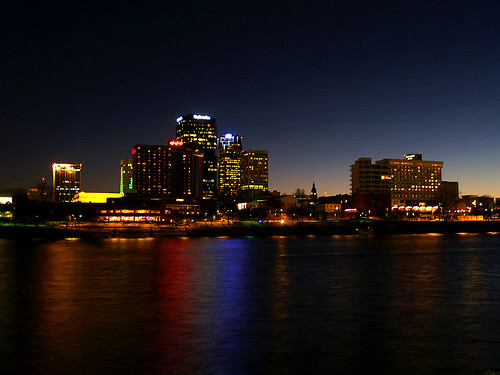 And a view of the skyline. 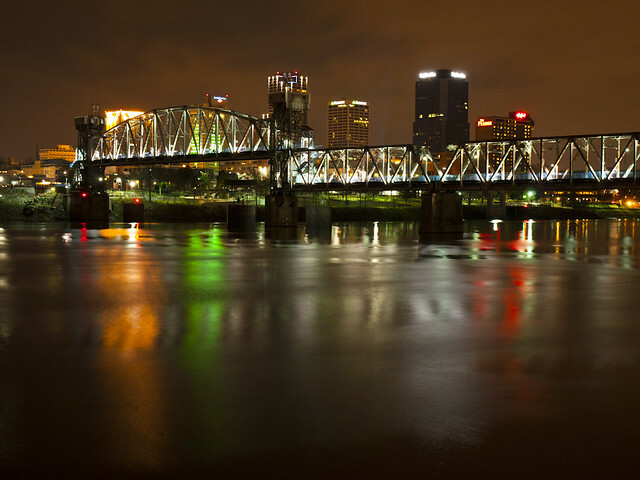 The Junction Bridge has to be one of the best places around to get pictures of downtown Little Rock. 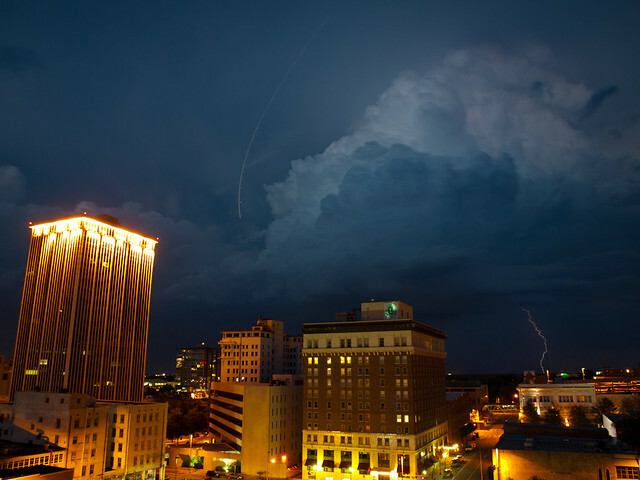 August 8: Downtown Little Rock, Arkansas. A huge summer storm came through town, dumping a lot of rain and lightning. The storm was enough to cause the power to go out in my apartment. So as the storm passed, I sat in the dark. 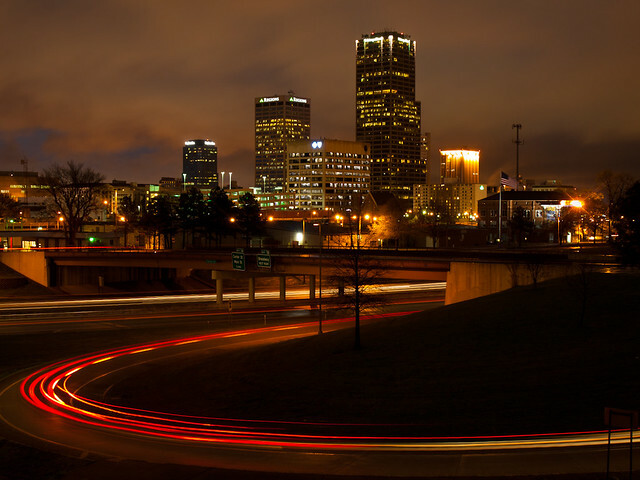 With nothing else to do besides look out the window, I grabbed the camera and headed towards downtown Little Rock. I went to the top of a parking deck and got a few shots of some lightning, and also managed to catch a plane taking off from the airport. October 9: Hickson Lake, Dagmar Wildlife Management Area, Arkansas. This is one of my favorite places to take photos, and luckily it's a fairly short and easy drive from Little Rock. 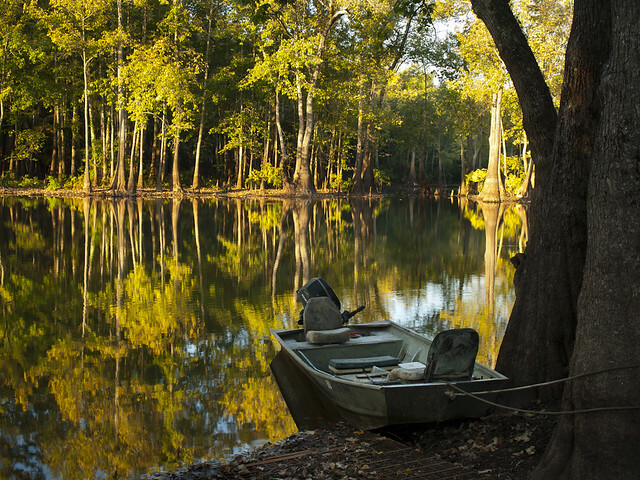 Hickson Lake is lined with tons of cypress and tupelo trees, and if you catch it with good light it can be amazing. This was a trip on an early Sunday morning, which I was extremely hesitant about since it would mean being awake on an early morning. But we got here just before the sunrise, and watched the sleepy lake come to life. May 14: Sweden Creek Falls, Arkansas. 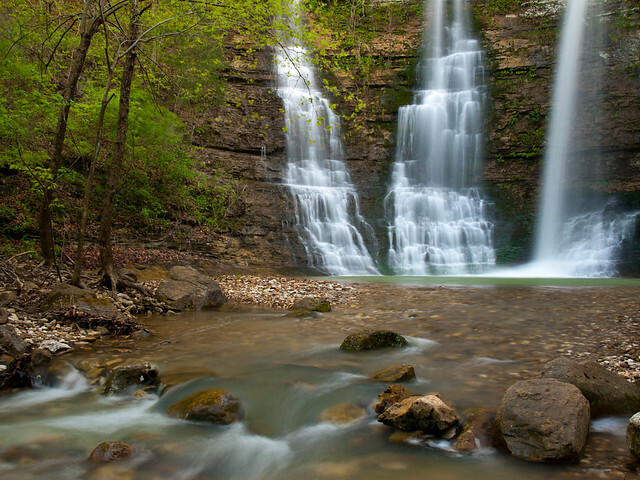 This 80 foot-tall waterfall is located in the Ozarks, just north of the Buffalo River. It was a cold morning, but luckily there was some nice water going over the falls. The waterfall is beautiful, but I thought that it wasn't the easiest to get pictures of. There are a lot of trees around it, and some debris left-over from the ice storm a few years back. 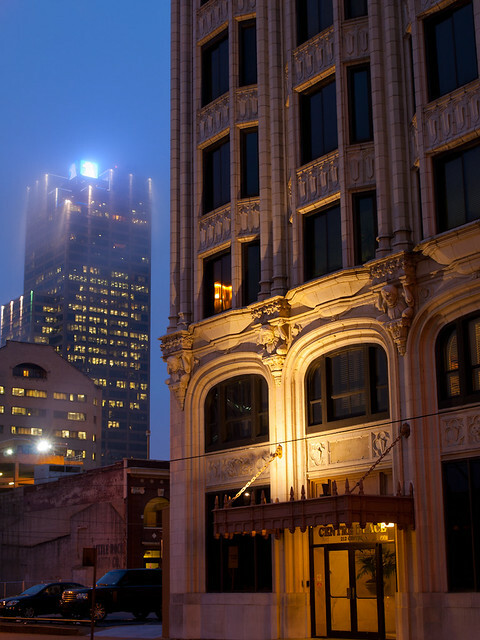 January 17: Center Street, Little Rock, Arkansas. 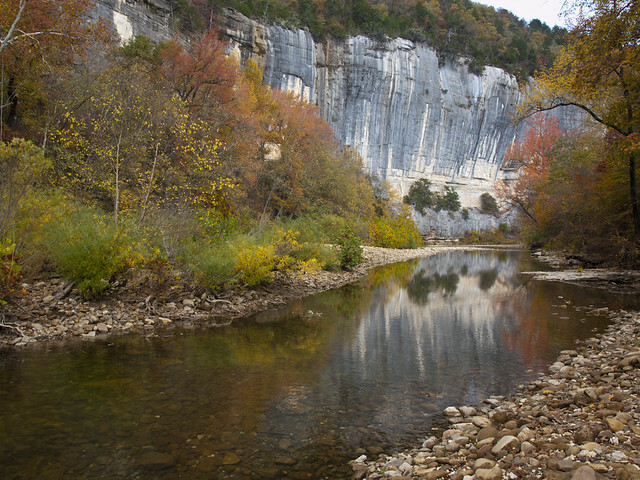 October 28: Roark Bluff, Buffalo National River, Arkansas. April 23: Longpool, Ozark National Forest, Arkansas. This was a perfect day for pictures: cool, cloudy and with a bit of fog along Big Piney Creek. This was in the spring, so I naturally assumed that there would be water at Longpool Falls. But after hiking to the waterfall, I was disappointed but not surprised to see that the falls were hardly running. I don't have a good history with Longpool Falls. I've been here several times and have never seen it with much water. Oh well. I did like how this picture turned out - this was taken in the campground, near the trailhead to the waterfall. I have family that lives nearby, so I've driven by Subiaco hundreds of times over the years. But I've never stopped there to take any pictures. 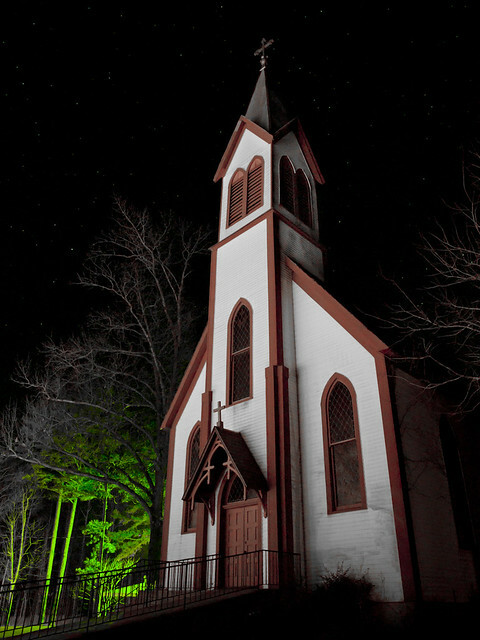 So after Christmas, I had the camera with me and decided to make a quick stop. It was a cold and rainy day, but I went out and made a few pictures while trying to keep the lens free of raindrops. 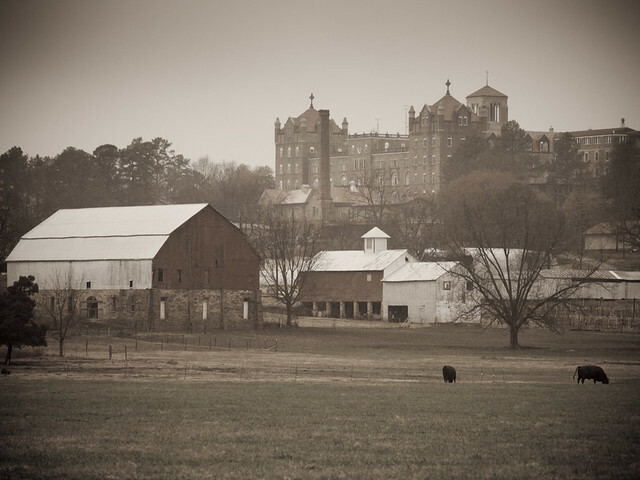 Subiaco is a neat old place, sitting on a low hill surrounded by old barns and pastures. 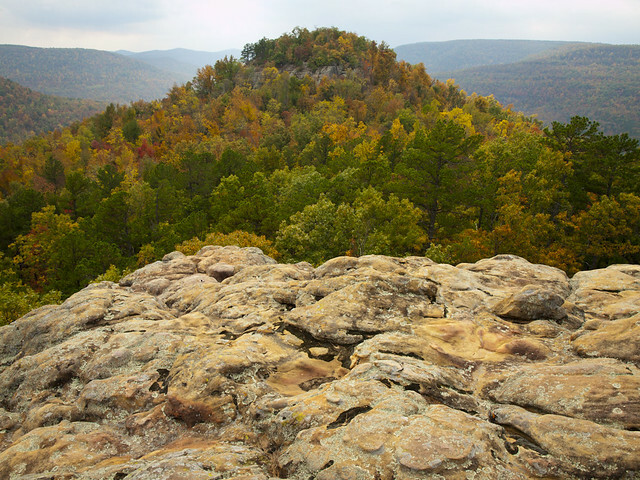 October 26: Sam's Throne, Ozark National Forest, Arkansas. I took a few days off from work and went camping up in the Ozarks with my friend Zack. We were extremely lucky to be up there during one of the best years for fall colors. On the first night, we camped at Sam's Throne. This is one of the neater places to camp in the Ozarks - you have one of the best views in the state just a short walk from your tent. The morning after this shot was taken, we both woke up before dawn and walked out to this overlook. The plan was to hopefully get a good shot of the sunrise, or of some nice fog at least. But a rainstorm was moving across the valley below. Before we knew it, the rain was right over us. A lightning bolt hit Sam's Throne, and we wisely decided to head back to the car for safety. In the pouring rain, we headed down to Jasper for a breakfast at the Ozark Cafe. After a very filling breakfast, we headed out to get a few other shots (some of which you will see below). 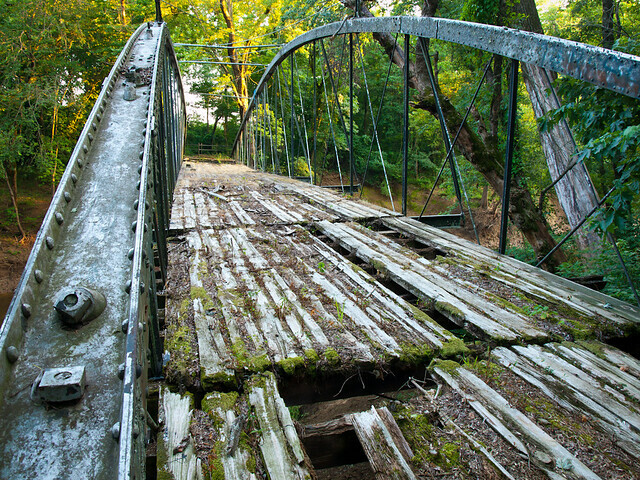 June 29: Springfield Bridge, near Bono, Arkansas. 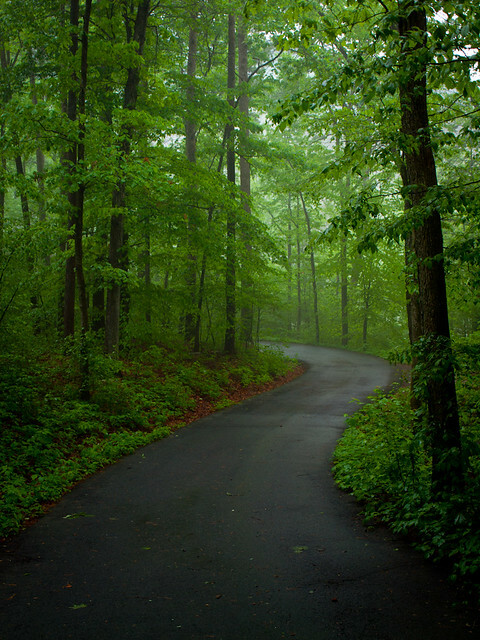 October 27: Hedge's Pouroff, Ozark National Forest, Arkansas. 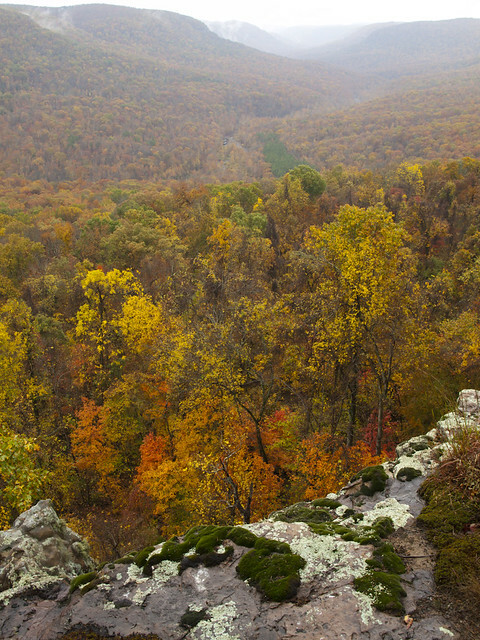 This is a view from Hedge's Pouroff, which is along a bluff that sits 110 feet above Boxley Valley and the Buffalo River. It was still pouring down rain, and the distant mountains were covered with fog. While the weather wasn't great, the conditions were perfect for taking pictures. I think this day might have been one of the better days of the year for taking pictures. 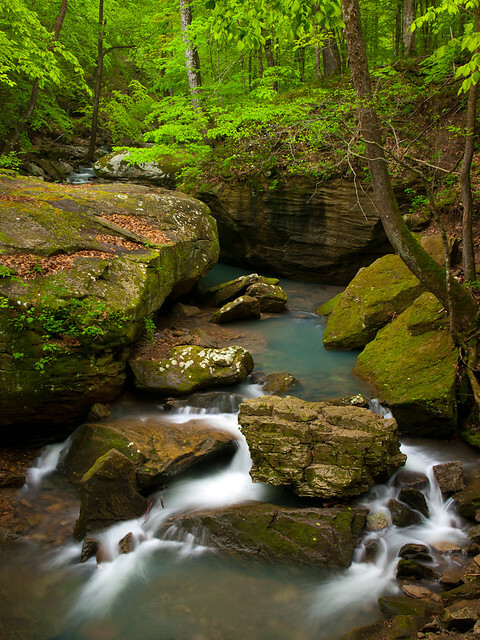 April 16: Little Punchbowl Falls on Bear Creek, Ozark National Forest, Arkansas. October 28: Erbie, Buffalo National River, Arkansas. After spending the night at the Erbie campground, we ended up crossing the Buffalo River at the low-water bridge there and found this large field. The mountains that surrounded the field had a small bit of fog that was dying off in the early morning sunlight. 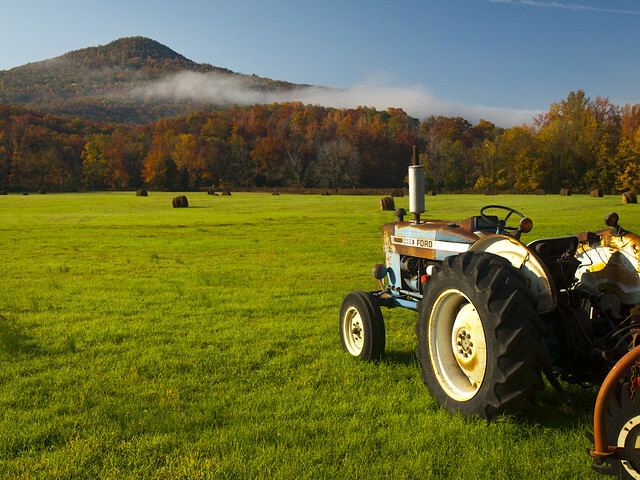 There was an old tractor parked in the field, which made for a nice subject for a few pictures. May 21: Cornelius Falls (aka Bridal Veil Falls), Heber Springs, Arkansas. 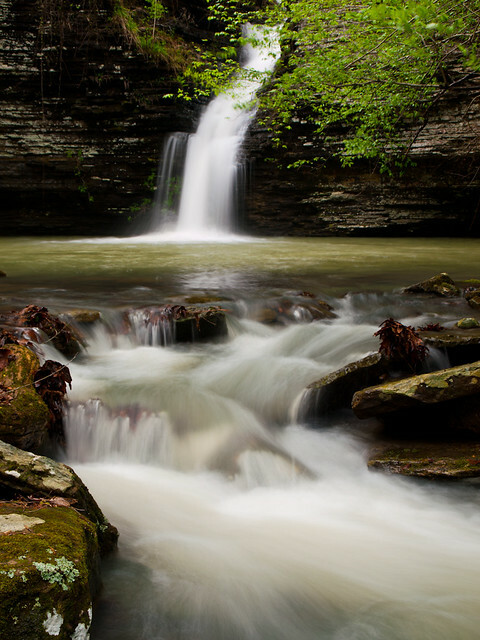 I drove to Heber Springs in May to get a few shots of this neat waterfall. 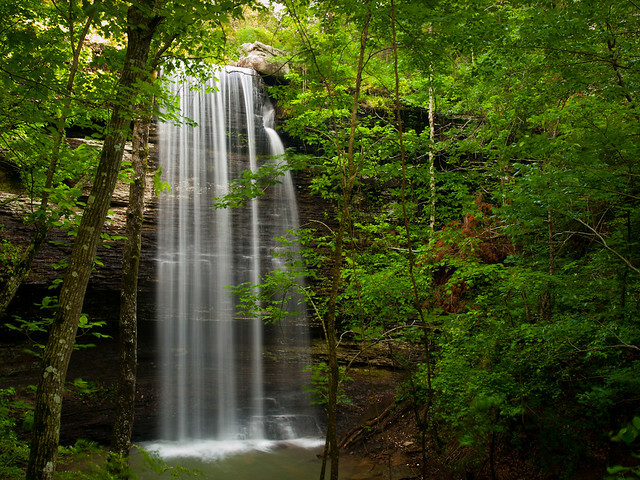 The waterfall is about 40 feet tall, and is located on private property. But luckily, the city of Heber Springs has gotten an easement that has allowed access to the falls. So now everyone can see the falls. The city has even built a viewing platform over the falls. So thanks, city of Heber Springs! April 30: Smith Creek Nature Preserve, near the Buffalo National River, Arkansas. 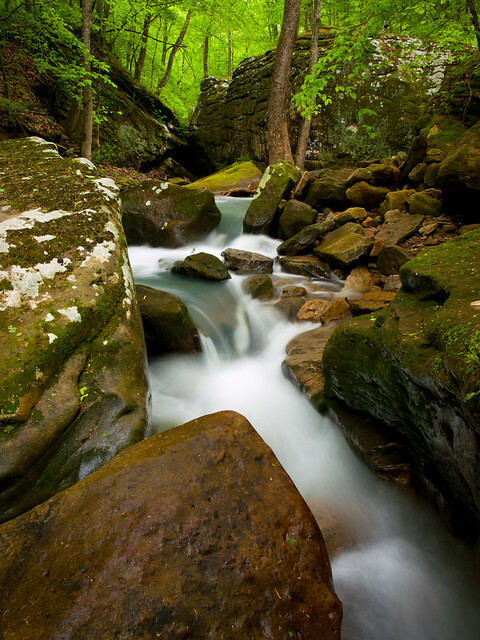 Smith Creek is an amazing area - the creek flows past huge boulders and a few small waterfalls. It isn't part of the National River, but is instead land preserved by the Nature Conservancy. I made this visit with my Aunt in the spring. We enjoyed the creek and the views, but didn't really like the long uphill hike to get back to the trailhead. 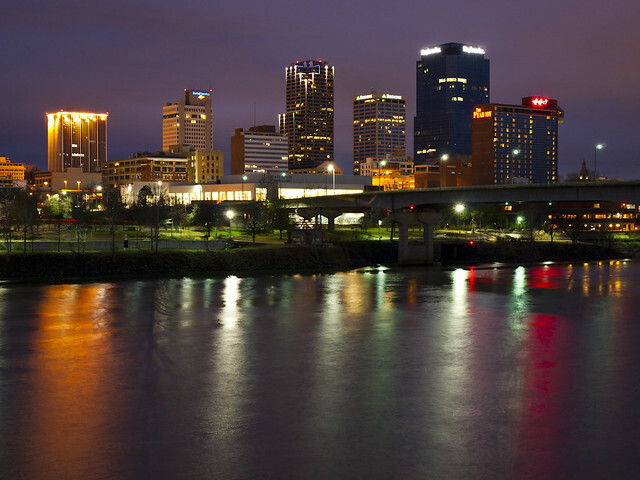 March 29: Downtown Little Rock, Arkansas. 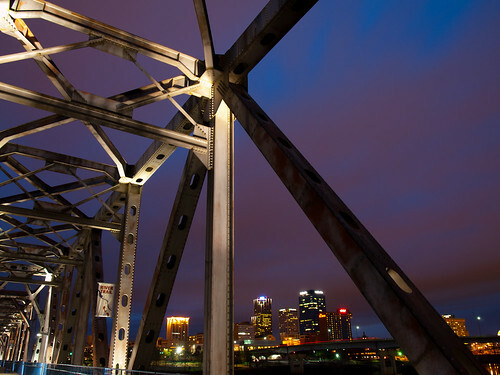 I headed out after work to get a few pictures of downtown Little Rock. It was another cold and rainy night, and I spent most of this night using an umbrella to try to keep the rain from getting on the camera. This is a view overlooking the Chester Street on-ramp onto I-630. May 13: Goat Trail along Big Bluff, Buffalo National River, Arkansas. 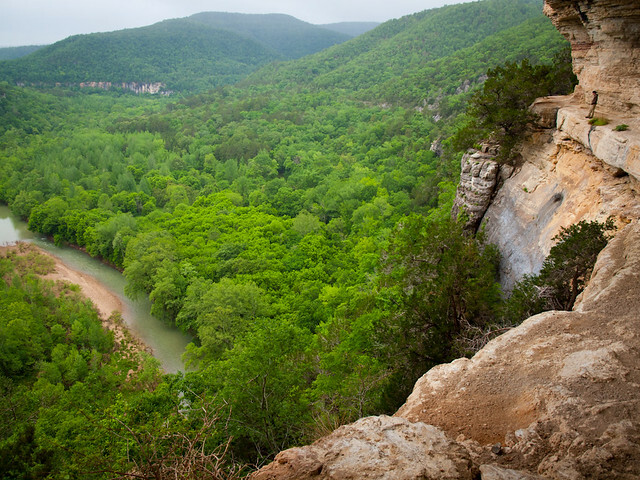 This is the view from the Goat Trail, which is 340 feet above the Buffalo National River. Now this was taken during one of the most bizarre camping experiences I've ever been on. To get to the Goat Trail, you hike about 3 miles on the Centerpoint Trailhead. We had set up camp that night, and had a good campfire going. I had heard a few coyotes off in the distance, and was then surprised to see a few flashlights in the distance. Somehow, someone was coming down the trail at 11:30 at night. At first, I naturally assumed that it was some sort of crazed serial killer coming down the trail. But it turned out to be a large church youth group from Tulsa. Apparently they decided, for some bizarre reason, to hike this trail in the middle of the night. They didn't know they had been hiking for three miles, or really where they were going. After standing around our campfire for a bit, they turned around and headed back up the trail. Which I can't imagine being any fun, since they were hiking 3 miles uphill, in the dark. But at least they didn't kill us! 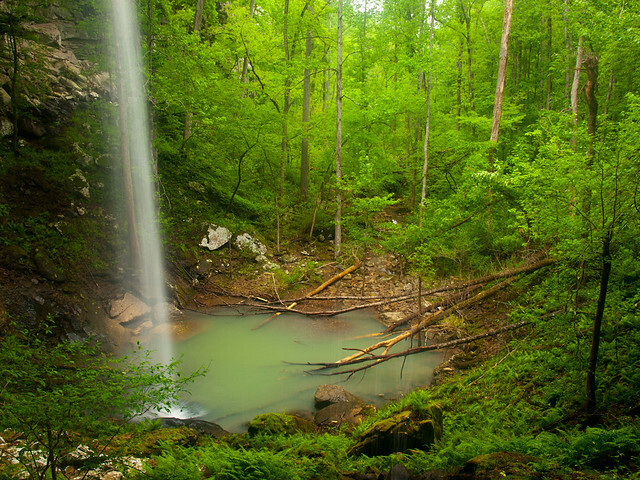 April 15: Brushy Grotto Falls, Ozark National Forest, Arkansas. I took off work this day and met up with Matt and Zack in Conway. We drove up into the Ozark National Forest and ended up finding some new waterfalls. We hiked a few miles and went through several drainages. I thought it was a somewhat annoying hike, since there were countless thorns along the way, that would grab and cling at you while you tried to walk by. But it was worth it, since we found some cool waterfalls. 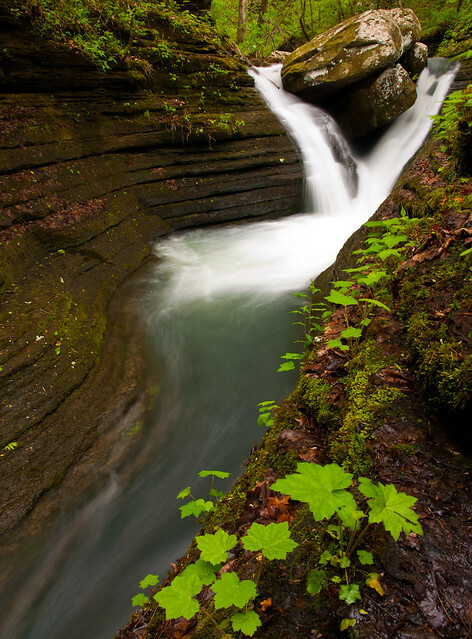 This waterfall pours into a grotto, which eventually empties into Brushy Fork Creek. For directions to this waterfall, visit Zack's site here. For some reason, he didn't include some other waterfalls we saw that day, which I decided to name after FC Dallas soccer players. 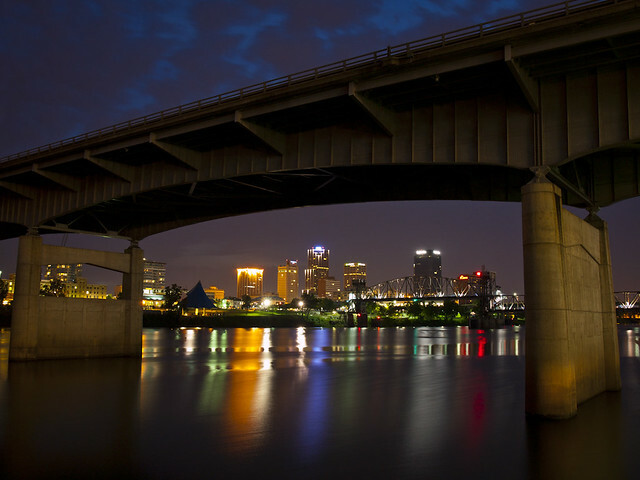 May 29: Downtown Little Rock, Arkansas. April 16: Triple Falls at Camp Orr, Buffalo National River, Arkansas. Like Longpool Falls, I have made several visits to this waterfall and have never found it running. My little joke is that it should be called Trickle Falls, not Triple Falls, whenever I try to drive there. But this spring was I amazed to actually see these falls running full-tilt. This is one of the coolest waterfalls in the state, and I'm so glad I was finally able to see it running with water in it! 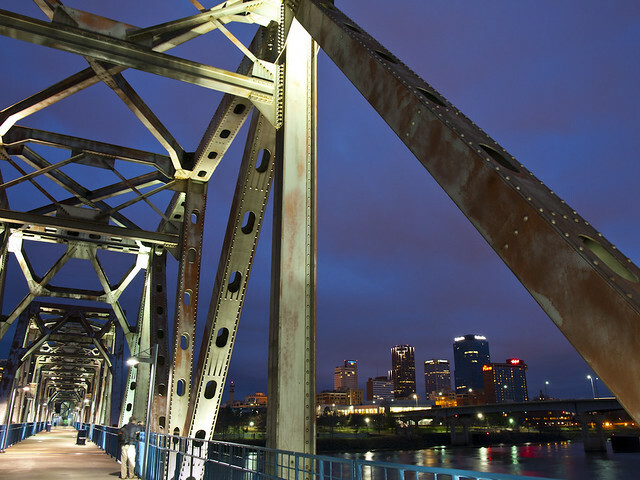 January 24: Big Dam Bridge, North Little Rock, Arkansas. My apartment isn't very far from the Big Dam Bridge, so I'll occasionally head out there when it looks like there might be good conditions for pictures. This was one of those nights. It was about 10:00 PM, and I headed out to take some trash to the apartment dumpster. But as I got outside, I saw some of the thickest fog I've ever seen around here. So I threw the trash away as quickly as I could, and ran up the stairs for the camera and tripod. It was very cold that night (34 degrees), but the fog was thick. 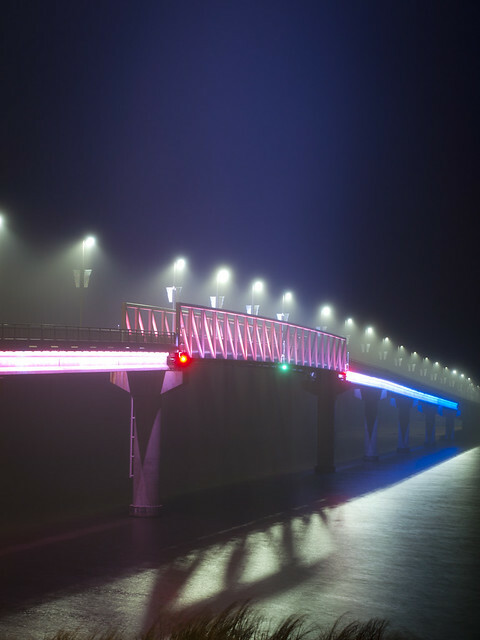 I stood at the bridge taking several pictures, and for some reason the blue lights on the bridge seemed to show best in the fog. 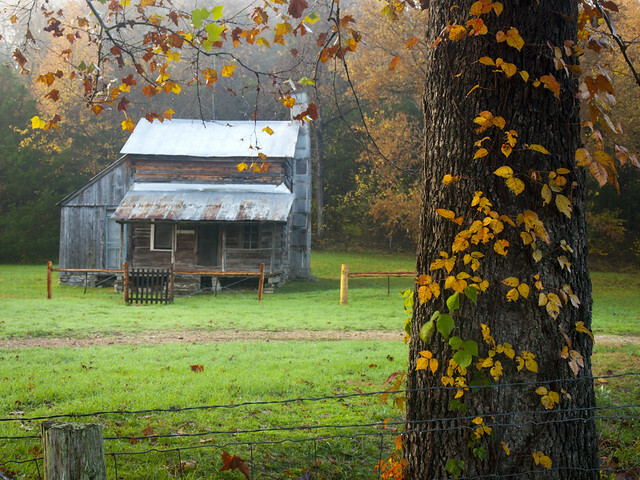 October 28: Parker-Hickman Farmstead, Erbie, Buffalo National River, Arkansas. 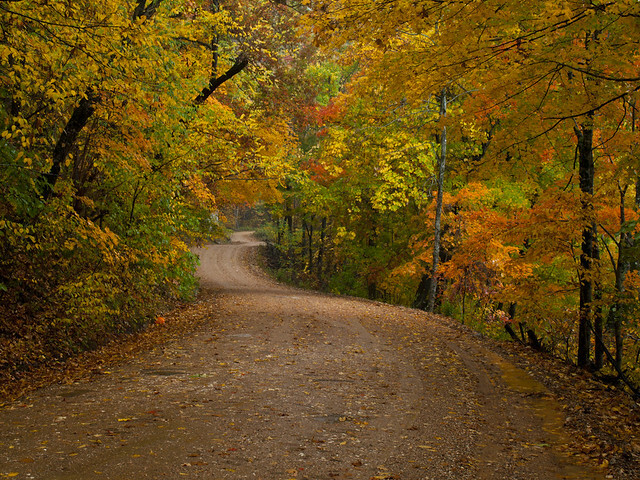 October 27: Road heading down to Kyle's Landing, Buffalo National River, Arkansas. 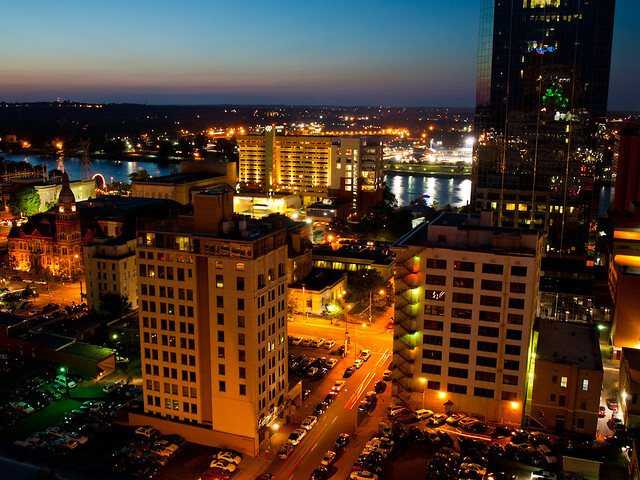 August 12: Downtown Little Rock, Arkansas. 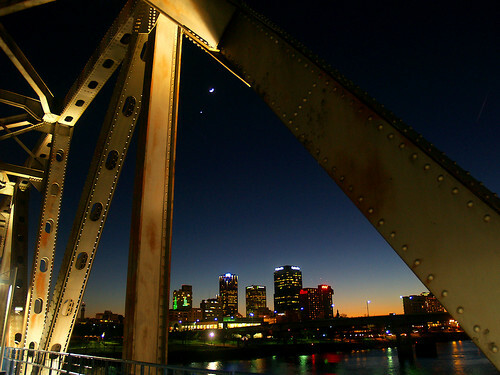 Dusk over downtown Little Rock, framed by the I-30 bridge. There was a storm moving in, which helped to produce the clouds seen in this shot. 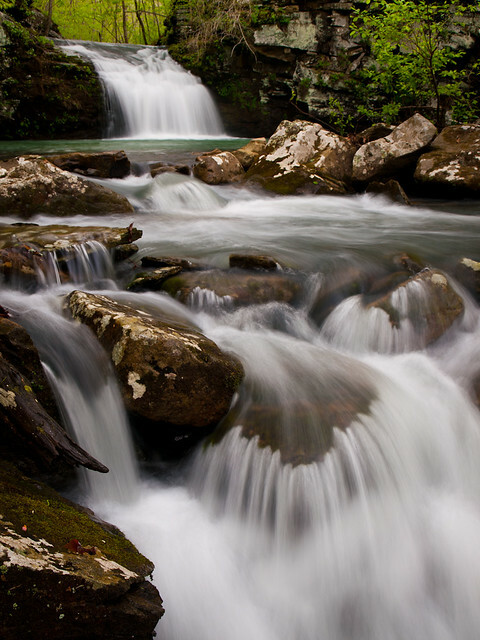 April 16: V-Slot Falls on Bear Creek, Ozark National Forest, Arkansas. Well so thanks to anyone who made it to end of this post - I hope you didn't get bored looking at old pictures! I hope that everyone who reads this has a great 2012. The past few years, I have tried to get out on New Year's Eve and take a picture of the last sunset of the year. So on Saturday, I tried to do everything right. I made sure the battery was fully charged, and that there was plenty of extra room on the memory card. I even remembered to bring the tripod too. Everything was set. So I got to the car and started to drive out of the parking lot when I noticed something odd. There was a strange whump-whump-whump noise, and the drive was a bit rough. Which of course means only one thing - I had a flat tire. I parked and got out to see the damage, and yup, the driver side front tire was completely flat (funny that it's the driver side tire, I walked right by it before and didn't even notice it was flat). So I stood by my car and said several curse words. The sky above me looked like it would be capable of producing a nice sunset. But while I'm no automotive expert, I know that you can't travel too far on a flat tire. I have an air compressor that can inflate a tire, so I plugged it in and considered my options. While the tire slowly reflated, I wondered if I should be risky and try to drive on it to get a shot of the sunset. But I let common sense tell me that I should probably try to get the tire fixed, even if it ruined a photo opportunity. So I ignored the sunset and made the (luckily) very short drive to a place that could repair the tire. I was surprised to see that I wasn't the only person around who had car troubles that day. The place I chose had a line, and two more cars pulled in after me. After waiting over an hour, I was finally told that the my poor tire was too damaged to repair. So I had to fork over money for a new tire. Happy New Year's Eve to me! I'd like to thank everyone who has visited this little website over the past year. I'm still amazed that people will venture over here to look at my pictures and read my ramblings.